What if you could julienne, grate, shred, peel and make decorative cuts with only one vegetable peeler? What if that peeler was ridiculously cheap, lighter than your phone and small enough to fit in your pocket? It may sound like a fantasy kitchen gadget, but this peeler exists -- and it can be yours for next to nothing. The peeler pictured here was found in Vietnam, but we've seen them in many Asian countries, including Myanmar and Thailand. You can use it to do pretty much anything, from peeling a potato and julienning zucchini to grating ginger. Because it's so light and small, you can hold the peeler in one hand and your food in the other. No matter which sharp edge you're using, the rest of the peeler is your handle. By having all your devices in one, you can work quickly between the different blades and you'll be left with less clean up. 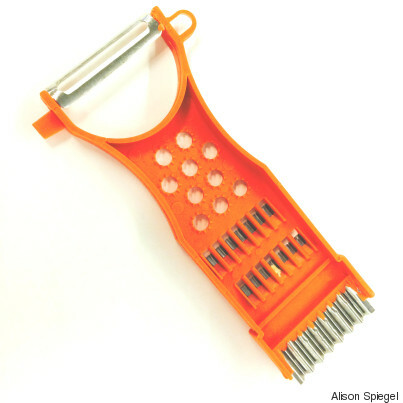 You can use the serrated holes to grate things like ginger or garlic. Unlike most graters, the large holes here make for almost effortless clean up. You can julienne vegetables, like zucchini, with incredible ease and speed. We're fans of zoodlers and spiralizers, but with this peeler, you don't even need them. You can skin fruit, like an apple, or shave vegetables, like potatoes and carrots. Finally, you can make decorative cuts. Fancy carrots are just the beginning. How about wavy potato chips? Enchanted yet? If you don't have a trip to Asia in your near future, fear not. You can find this peeler or similar versions on eBay. Once you lay your hands on one, you'll have a hard time letting it go. 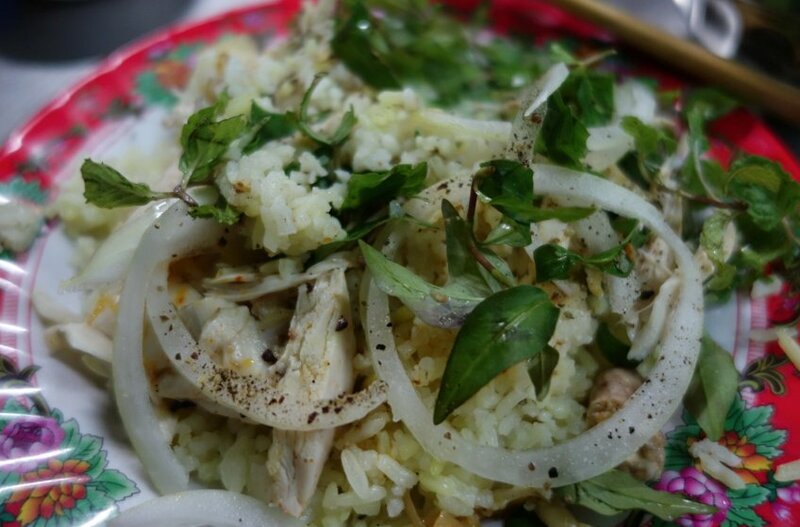 A chicken and rice dish that is a speciality of Hoi An, a beautiful town and UNESCO World Heritage site in Central Vietnam. Served here with plenty of bitter herbs.